My word for you is SOAR. There are so many different directions we can go with this word and I'm excited to see what you all do! To me, soar means to spread your wings and fly....float aloft, rise higher, sail away to where you are, want to be or are going. The technique I'd like to see is to reverse out a shape on your page...I chose a circle and I've done it with stars and hearts too, but use any shape you want. Off set it a bit on your page. I started with a page from the dictionary, and though it might be hard to see on the photo, the word soar is in the center of my circle. I covered the whole page with gesso, then used darker oil pastels to make the shape stand out. I took a green oil pastel and bordered the shape. Then I cut out a circle and placed it around my reversed out shape. I also used oil pastes on the circle and smudged them for a soft transfer from one color to the other. 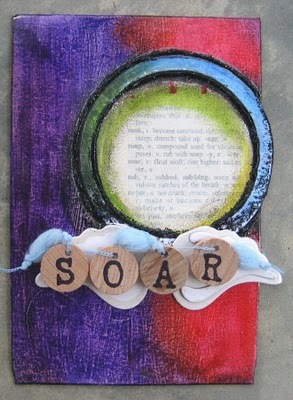 I bordered that shape with some black stickles, then added the wings and the word SOAR on some wooden alpha tiles. I found this fiber in my stash and thought it looked like clouds. I wove it through my tiles for a dreamy, heaven/sky like look. Have fun with this prompt! I can't wait to see all the awesome pages you all create! I just wanted to let you kknow that I am a huge fan! Your style is fresh and exciting! You inspired me so much that I created a layout much like the one you had published in Somerset. I did a video on it and told the world how world you are! Please visit my blog in a few miutes for the link. It's currently uploading!